Advertisers and publishers have been talking for years about a coming time when digital video advertising would finally take off and account for a significant share of spend. Well, that day is finally here. The digital video advertising market is suddenly growing very, very, very quickly. According to recent data from Business Insider, the digital video market is set to expand faster than that of any ad medium aside from mobile over the next two years—reaching $5 billion by the end of 2016, compared with $2.8 billion now. This forecasted annual growth rate of 19.5% far outpaces the expected growth rate of search advertising (8.6%), display (2.9%), and other digital ad formats (6%). Not surprisingly, significant changes in the market are accompanying this massive and rapid growth. Some of the developments are due to the increasing importance of video ads—small upstarts are suddenly reaching scale, bigger players are entering, and consolidation is rampant. Other changes are actually driving some of the growth, including the development/maturation of ad formats and platforms. You’ve probably heard some version of this phrase over and over recently: Mobile is changing everything. The thing is, despite it being said all too often, the sentiment is true—especially when it comes to digital advertising. The explosive growth of digital video advertising over the past year, and its projected future growth, is largely due to the explosion in, and evolution of, mobile usage. Why? First, the technology is finally ready. Most users in developed countries now have smartphones and access to high-speed networks/WiFi, making it possible to serve video ads quickly and consistently. Second, video ads have proven to be more effective than many other formats on mobile—in particular banner ads—which are often overlooked by consumers on portable devices (or clicked on accidentally). For advertisers, this trend is important because it sparks key questions such as: Are you creating ads that are of the right length for mobile viewers (i.e., short)? Are you targeting the right platforms (i.e., not just standard publishers but also app creators)? Are the landing pages you promote in your videos mobile optimized? Google currently dominates the search market. It receives 84% of paid spend in the U.S. and delivers 86% of impressions as well as 65% of clicks, according to recent data. The digital video landscape is more fragmented, but what is sometimes forgotten is that Google still delivers the largest audience in this market as well. 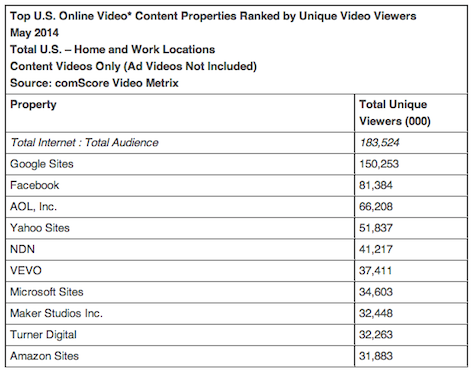 According to comScore, the company’s video properties had more than 150,000,000 unique viewers in May—more than its next two competitors combined. What is the key to this success? YouTube, which is responsible for the bulk of Google’s video views. While everyone is aware of YouTube, the scale of the platform’s audience is sometimes forgotten. 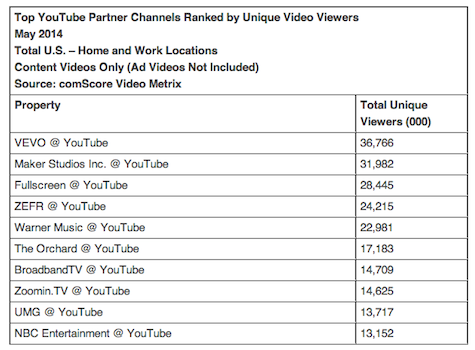 To put it in context, a number of the top YouTube partner channels now deliver larger monthly audiences than most cable networks. Why does this matter for advertisers? Because, right now if you want to reach a large and diverse audience via digital video ads, Google often remains your best option. This is especially true because of the company’s integration of its YouTube inventory with its other ad products, allowing for powerful reach and retargeting options. Google may currently deliver the largest consolidated video audience, but it has stiff competition from a familiar competitor: Facebook. In the past year, Facebook’s video audience has jumped by more than 20,000,000 monthly viewers—a faster pace of growth than any of the other major platforms. Just as importantly, the social network has rolled out a series of video ad products over the past two years that allow advertisers to reach not just its video audience, but its general users as well. For advertisers, this is key because it opens up a world of possibilities. Since Facebook has so much personal data, it can provide excellent targeting options for its video ads. 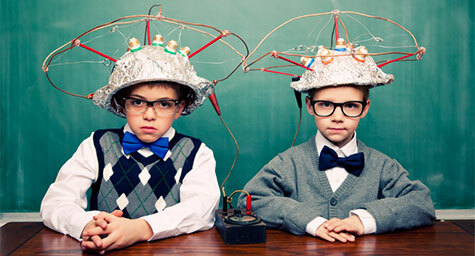 Moreover, its platform now allows for many of the same retargeting options as Google. 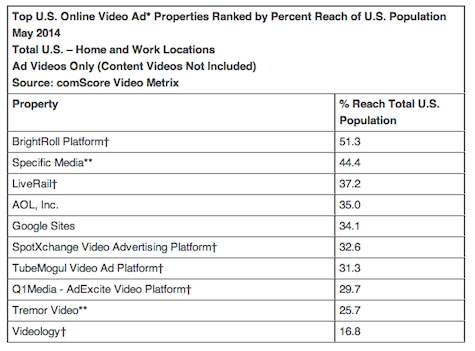 One of the most interesting things about the digital video ad space right now is the wide range of players in it. Google and Facebook do a good job of delivering the biggest consolidated audiences, but they by no means dominate video ad serving. In fact, a broad mix of other platforms/exchanges has the widest reach. This current state of competition is great news for advertisers because it both keeps costs down and spurs innovation. In particular, the various platforms are competing hard on everything from inventory and targeting options, to measurement tools and dashboards. Given all this, there is a strong incentive for advertisers to experiment with various digital video ad platforms/exchanges, since the most effective option could vary from situation to situation. Ultimately, these four trends are just the tip of iceberg. There are, of course, many other important key things to watch in the digital video ad space. Still, if you at least keep an eye on mobile, Google, Facebook, and the evolving exchanges/platforms, you should be well positioned for the exciting growth period ahead. Take advantage of the influence and impact of digital video advertising for your brand. Contact MDG Advertising today at 561-338-7797, or visit mdgadvertising.com. MDG Advertising is a full-service advertising agency and one of Florida’s top branding firms. With offices in Boca Raton, FL and New York, NY, MDG’s core capabilities include branding, logo design, digital marketing, print advertising, mobile marketing, email marketing, media planning and buying, TV and radio, outdoor, newspaper, digital video advertising, Web design and development, content marketing, social media marketing, and SEO. To stay on top of the latest trends in marketing and advertising, contact MDG Advertising today at 561-338-7797.